Rickie Fowler's win at the Waste Management Phoenix was not pretty to say the least! If it had been an F1 race, he would have been half a lap up on the field and on the final lap, only to then blow all four tyres and see his gearbox stuck in reverse but recover to win by driving down the final stretch with an ounce of gas left in the tank. Report and highlights from Rickie Fowler's win at the Waste Management Phoenix Open. Winner? Yes. Winner in style? If you say yes, you need to update your closet! But does him winning or winning with style really matter? His track record over the last few years as 54-hole leader, with the exception of his rookie season in 2010, has been less than stellar. Final round averages hovering around 73.5 are not going to get it done on the PGA Tour, or any tour for that matter. One win in five previous tries does not garner him the "closer" status that others in the game seem to possess, but does it matter that he has not won more times around the world than he has? Rickie's win last week impressed me as he had every opportunity to lose his cool after the debacle on 11, following it up with a bogey on 12 to lose his lead. He showed a mental toughness few thought he possess, with his quick smile and easy demeanour showing otherwise. Sure he may not win as much as his fans would like, but how he handled all that was thrown at him on Sunday and to still find the winner's circle will certainly endear himself to even more that follow this game, if that's possible. I will tell who it does, and does not, matter to the most: Rickie Fowler. After his win on Sunday, he gave an open and honest interview to Sky Sports Golf's Henni Zuel (see below). Do his words remind of you of Greg Norman after his debilitating loss at the Masters in 1986? Sure they do. But whose words sound more sincere? Norman, who talked about having $200M in the bank and heading to his yacht to drink off the heartbreak of losing the title which he coveted the most? Or Rickie, who even in victory, spoke about if he would have lost, that there are bigger things in life? 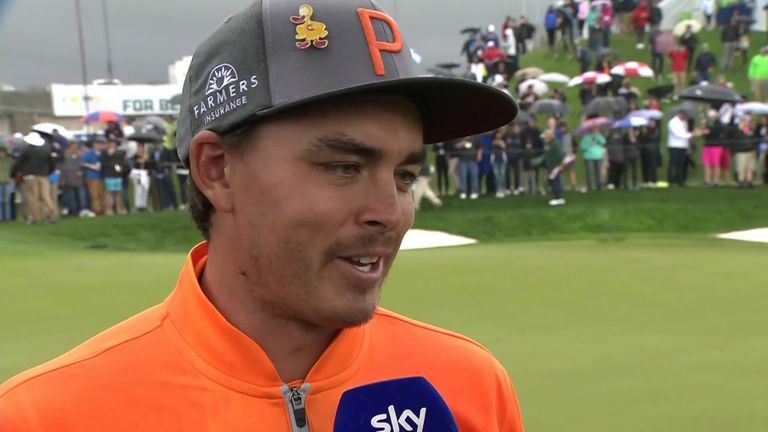 Rickie spoke openly about the loss of two people close to him who passed away in 2018; Jarrod Lyle and Griffin Connell. Lyle succumbed to cancer after battling it three different times, while young Griffin died just over a year ago before Fowler's win last week. He had every opportunity to talk about the win and what it means to him and his sponsors, but he took the time to mention two friends he has lost. If Sunday was not his day then so be it, as he was not deflecting as most would think, but reflecting. Reflecting on what really matters to him the most and that along this journey through life fans will remember him for his wins, but his friends will remember him for him. So to all the detractors who look at the wins as the greatness of the man, I hope you will be happy being buried with your trophies…alone.